Edgar's Great Uncle (or is it Great Great? Or Great Great Great?) Montague lives in a cold, lonely house in the woods. It's a scary and desolate place, but there's a reason why Edgar visits him regularly: he's hooked on Uncle Montague's spooky stories. 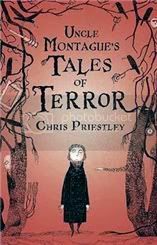 Uncle Montague's Tales of Terror takes place during one of these visits: Edgar and the elderly man sit by the fire and talk in between the telling of stories. And the more Edgar hears, the more alarming his suspicions about Uncle Montague become. Could he have lost his mind? Or is there a sinister reality that his stories hint at? Ana: One of the things I enjoyed the most about Uncle Montague's Tales of Terror was its slightly old-fashioned feel. This is true of both the stories and the illustrations by David Roberts, which reminded me a little of Edward Gorey (as I suspect they're meant to). If someone had told me these were Edwardian creepy tales, I'd have easily believed them. Did the book feel older than it is to you too? And if so, did you like the fact that it did? Amanda: Yes, for the most part, they did feel old-fashioned to me. There were a couple tip-offs that they were newer tales - some of the deaths were a bit more descriptively gruesome than they would have been 200 years ago, for instance - but mostly I thought Priestley kept with the traditional fairytale vibe. In all honesty, you picked up on the only thing that I felt detracted from the book, which was the few deviations from that old-fashioned feel. For example, while most of the tales seemed to have a traditional built-in moral lesson (don't steal, don't lie, etc), the ones that didn't fell a bit flat for me. 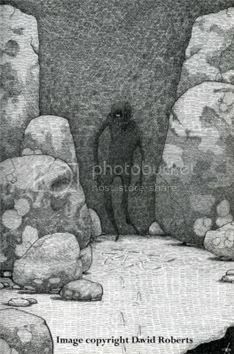 Were there tales that you liked better than others? Worse? Ana: It's funny that you brought up the traditional "moral", because I was planning to mention that soon! I normally really dislike stories with a specific "moral" or "message", but I think the reason why that didn't bother me at all in this case were because they felt so...traditional. Like you said, they had a feel a little similar to that of fairy tales, or of old-fashioned ghost stories like M.R. James' (the atmosphere reminded me quite a bit of James, actually). There's also the fact that there was a bit of dark humour, Gashlycrumb Tinies style. So while most of them were cautionary tales, they were more self-consciously than moralistically so. I did have a few favourites, though - "The Un-Door" (the story of two women who pretend to be mediums until one day, at one of their seances, are forced to face what they have been using to exploit others) and "Winter Pruning" (about an old woman, said to be a witch, who lives in a cottage with some very interesting apple trees in the garden, and about a boy who attempts to steal from her) were perhaps the top two. My least favourite was actually "Uncle Montague", the story that ties them all together - it just felt a bit forced to me. What about you? Amanda: Actually, I didn't mind "Uncle Montague" - I thought it tied everything up nicely, if predictably. I expect a certain amount of predictability from my fairy tales, though, so that didn't bother me. "Winter Pruning" and "The Un-Door" were two of my favorites, too, as well as "The Gilt Frame" (girl gets possessed by a new portrait in her home, only to find out the portrait is not what it seems). Usually, books or stories with a heavy-handed moral or message, like you said, are sort of irksome to me as well, but I like a straightforward, fable-like feel in fairy tales (even if the morality or message isn't traditional). "Winter Pruning" was just about perfect in message and in tale, and the last line was so frightening it made me cringe. On the other hand, there were stories that seemed kind of pointless. For instance, I didn't understand "The Path" (a boy sets out on a journey only be find himself chased by a very grisly creature) at all. I mean, it was creepy, sure, but I didn't see the point. Am I reading too much into this? Or did I just miss something? I agree that the ending of "Winter Pruning" was brilliant - that story reminded me a little of Daphne du Maurier's short fiction, and that's high praise indeed. Returning to the final story, "Uncle Montague", did you like the fact that there was an overall plot to the book, rather than it just being a typical collection of short stories? Please head over to Amanda's blog to read the second half of our chat! It was a pleasure, Ana. I hope to joint review again with you someday! I love joint reviews! Interaction brings out so much more! The pictures in this book are definitely creepy. Ooh, now I really need to know what the last line was in "Winter Pruning." Good job with making me want to go out and read this! What a great book review with interaction. I have got to read this book, thanks for the heads up. What a great chat! I just have to say I love, love the cover. It's so adorable. Definitely adding this one to my wishlist. Oh no. You are throwing all these new authors to me to look up. Edward Gore and M.R. James. Now I need to investigate. I was really bad and read Amanda's part first. Sorry, sheer laziness, following the order they appeared in my google reader. I want this book and I am struggling not to purchase it before Christmas! It was in my hands on Monday, along with the other one he wrote. I had to take deep breaths and put them down and walk away from the books. I like conversational reviews - brillaint. There are now 3 books in this series ... I bought the first some time ago, and I think it'll have to be moved up the pile for Christmas! Oh, dear... First Carl, then Chris, now you and Amanda. And I was doing so well at avoiding this series. I think it's funny how you can tell a lot from a cover. For instance, as soon as I saw this cover I new it was something that I'd want to read. After reading your discussion I know it is. I think I'd heard of this collection before, but somehow forgot about it. I'm adding it to my Amazon wishlist so that doesn't happen again. I don't think it's going to be on the wishlist for long though, because I want to read this RIGHT NOW. Lol. Sounds wonderful. From what I see here, I like the illustrations. Think I'll put this on a list for next year's RIP challenge! I would have to pick this up just for the illustrations! Brilliant! I think I remember hearing about this not that long ago. It really sounds neat though! I think the 'old' feeling of the book would help balance the morals for me. What a great joint review! This book sounds pretty sweet. It somewhat reminds me of the Scariest Stories series from the late 80s/ early 90s. I think I'll have to put this on hold at the library. I don't like scary stories, so I can't comment on that part but I do like fairy tales and I think it interesting that the "morals" seemed a necessary part of this story collection: it does make a story into a fairy tale! How fun to do a joint review! This sounds wonderful! I'm quite persuaded to get one. I found your blog while browsing on bookish blogs and your banner caught my attention. From Peter Pan isn't it? Penguin Classics? Well, Carl already had me wanting this one, but you two have just upped the craving level by a few notches! So glad you liked this one as much as me. The 2nd book, Tales of Terror from the Black Ship, is even better. Grat review! This sounds very good, love the cover too. Christy, I hope you enjoy it as much as Amanda and I did! Vivienne: I can imagine! I actually managed to resist this one at my local bookstore too, before Amanda was kind enough to give me a copy. Annabel Gaskell: Must get my hands on the other two! J.S. Peyton: lol, I know the feeling :P And I keep (multiple) wishlists exactly because I don't want to forget! Terri B and Daphne: The illustrations are wonderful! I wish I had found more online to share. 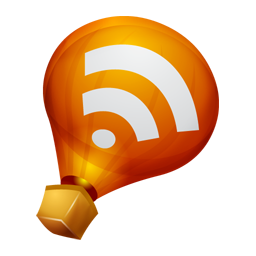 Ladytink: Quite a few bloggers had and reviewed it for RIP! She: I never read those, but I've heard about them from other bloggers and the feel does sound similar. Cutlex: Yes! By Arthur Rackman :D Thank you for stopping by! Cath: Even better? Can't wait to read it! Mariel: They really are! I wish I'd found more online. Sounds very good! I've developed a taste for dark humor lately. This sounds like a lot of fun and I like the quirky cover. Sounds a little in the style of The Graveyard Book with lots of mini stories within a larger one. Fun question and answer review of the book. I enjoyed this one so much. I ended up taking it with us to our recent camping trip and reading several of the stories aloud to Mary and Tori in front of the fire. It was just as deliciously creepy the second time around when sharing the stories with them. OK, i guess you're the last straw. I am convinced! this is now on my wish list!